BETHESDA, MD – Newland Communities’ Cinco Ranch, with 887 net sales, was 2009’s top-selling master-planned community (MPC) in the U.S. according to RCLCO. Each year, RCLCO invites over 400 communities across the U.S. to participate in the survey. 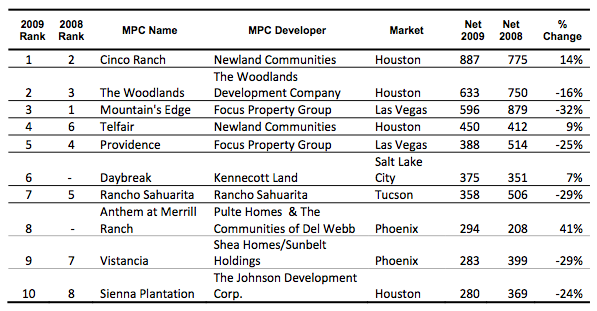 As in past years, a majority of the top-selling master-planned communities have been located in the southwestern region of the country, with the Houston market performing best overall. The Woodlands knows something about adapting as well. Now in its 35th year, the MPC has widened its selection of new homes to include a broad range of price points and lifestyle preferences – from urban townhomes and condos in Town Center, to large family homes and estates in the villages. “In the near future, we will continue to develop our ninth village, Creekside Park, which was designed for families who appreciate the outdoors and communing with nature. There’s also a considerable amount of land to develop in the Town Center area, where the East Shore Garden District and more urban residential offerings will be added for families, empty nesters, professional couples and singles,” said Tim Welbes, President of The Woodlands Development Company. Newcomer Daybreak, near Salt Lake City, may have drawn lessons from more established MPCs, yet this showcase community for sustainable ideas and technologies is blazing new trails and outperforming the market. “The economic downturn has actually heightened buyers’ interest in living in a place like Daybreak, so we have found that the decisions we made early on in the creation of Daybreak have placed us in the sweet spot of the new era we are entering. Key elements like a commitment to homes that save energy and water, providing transportation choices whether they be biking, transit or car, homes and yards that free up time to enjoy nearby parks, are all things that resonate with home buyers in the current economic environment where we are defining a fullness to life, while living within our means,” said Ty McCutcheon, Vice President of Community Development. When asked about their predictions for 2010, a majority of survey respondents (71%) believed home prices within their MPCs would increase by 1% to 5% this year.